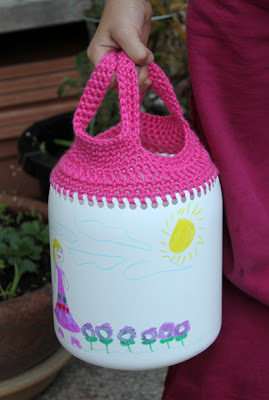 I never thought I would see a fantastic way to combine crochet with something as mundane as a bleach bottle. But, here it is! And, doesn’t it look cool – and useful? I can think of a lot of ways to apply this idea. There’s a good tutorial to guide us to make our own. I think this would be a great idea for the pool or beach (punch a few holes in the bottom for drainage), for a small portable toy chest, as a hanging planter, or to carry a crochet project around with you. I know a lot of crocheters are going off to look for a suitable container right this minute! How about a milk jug? Maybe a gallon vinegar bottle. For smaller hands, say a portable Barbie house or Hot Wheels garage, a 2 liter soda bottle will be perfect. Best idea for this time of year is a free (as in recycled from your trash bin) Easter Basket. Decorate it with stickers or just use a cheery yarn for the handle and clip up some yarn scraps for the ‘grass’. Any more suggestions? I wanna run with this idea!!! How about margarine tubs! Great idea, especially for the beach! Great idea! Question… does anyone have a way of crocheting on and covering wire or plastic hangers? My mil did this years ago, and they are wonderful… she just covered the wires themselves, leaving the centers open so you can still hang pants, but passed away years ago, before I ever met my dh… so, can anyone show us how to do this?? Thanks. I’m looking for a tea cozy for my teapot. Would appreciate A pattern if anyone has one.